I am fortunate to work with and mentor gifted and hardworking undergraduates. They not only help to advance the research I do, but also to add to the satisfaction I gain as a scientist. If you are interested in working with me, please get in touch! Brooke with her chameleon, Jabba. Zoology, class of 2018. September 2015 - present. Brooke is working on a project that is looking at a lineage of Cit- clones that persisted in the Ara-3 population for more than 10,000 generations after Cit+ became numerically dominant. How did this lineage survive when Cit- was outnumbered up to 100 to one? Part of the explanation is that Cit- evolved to use byproducts, C4-dicarboxylates, excreted into the medium by Cit+ during growth on citrate. Brooke is currently examining how important access to these C4-dicarboxylates is by eliminating the ability to use them in Cit- clones from a time series from 33,000 through 43,000 generations. Brooke is also working on a project in which she is looking at the evolution of Cit- specialists in populations founded with Cit+ clones and evolved in a citrate-only resource environment. Visiting student from Kalamazoo College. 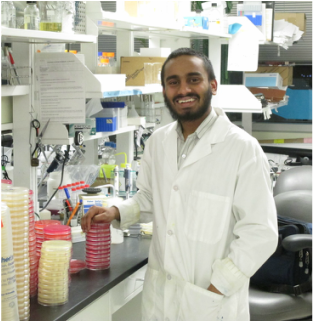 Tanush is working on a project aimed at determining what genes are required for the expression of the Cit+ trait. The evolution of novel traits like Cit+ are contingent upon the existence of a genetic background in which it can arise. This means in part that the expression of a new trait generally depends on the activity of pre-existing genes. This may be seen as both a form of potentiation and deep contingency, as well as a reflection of how evolution builds new structures and traits from and upon the old ones. Tanush is seeking to identify the genes required for the Cit+ trait by screening a library of mutant E. coli, the Keio Collection, each member of which has an insertion disrupting a different gene. This screen involves transforming each mutant with a plasmid that normally confers the Cit+ trait. If a transformant does not show the Cit+ trait, then the gene that is deleted in that transformant is putatively necessary for aerobic growth on citrate. He will follow up this screen by targeted knockouts of the candidate genes to confirm their necessity. Human Biology, Class of 2020. ​Jessica is just getting started, but will be working extensively with Brooke on her projects. Previous work (Blount et al 2008) has shown that the evolution of citrate usage in the Ara-3 LTEE population was contingent upon the construction of a potentiating genetic background that improved the rate of mutation to Cit+, likely due to metabolic pre-adaptation that made a final mutation effective in generating the Cit+ trait. Maia's research involved investigating whether or not potentiating genetic backgrounds have evolved in the other 11 LTEE populations. She presented her preliminary data at the 2015 ASM General Meeting in New Orleans. Kiyana's research involved investigating aspects of specialization in the Cit+ lineage in Ara-3, a question that has implications for understanding the ecology of the population, as well as whether or not Cit+ is a new species in the making. She presented her preliminary data at the 2015 ASM General Meeting in New Orleans. May 9, 2015, Maia and Kiyana's graduation.